Telepathy, precognition and psychokinesis – which may or may not even exist – are the subject of study at the Parapsychology Unit of Edinburgh University, established in 1985 as a result of a bequest from Arthur and Cynthia Koestler, to foster research into ‘the capacity attributed to some individuals to interact with their environment by means other than the recognised sensory and motor channels’. Part of scientific truth relies on an experiment being able to be replicated anywhere by anyone under broadly similar conditions and achieving the same result. So what the Parapsychology Unit researchers do relies not at all on birds’ entrails and drops of ink in bowls of water, but rather on computers and random number generators. Therefore, they are trying to apply scientific method to something which may not even exist. Some of the random number experiments are hard to quantify; I am so much a non-statistician that I cannot advance any defence of the significance or otherwise of an occurrence being x% more than chance and even worse what thehance is that that 0s chance or otherwise. 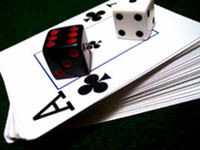 A telekinesis experiment, for example, attempts to establishwhether a subject can, by sheer concentration, influence a random number generators to produce a significant number of 1s rather than 0s. The Unit, which pursues ‘the study of apparent new means of communication, or exchange of influence, between organisms and environment’, states on its website that, ‘if psi exists, it is likely to be an ability that is weakly but normally distributed in the general population. The people who take part in research are almost always just volunteers who do not profess to have any psi ability. Studies suggest that disbelievers in the paranormal (called ‘goats’) tend to perform less well in a psi task than believers (called ‘sheep’). Rather sheepishly, I became a volunteer subject. The first thing I noticed, naturally, was the Unit’s reassuring mundaneness and utter lack of stuffed crocodiles and alembics. I then spoke to a researcher and agreed that, yes, I came from a background which possibly predisposed me to believing in the apparently inexplicable. At the Parapsychology Unit I was also shown a series of clips of someone talking directly to camera while performing card tricks; I had to specify whether or not he was cheating and/or lying. To my consternation, in one instance I said he was lying but could not justify why I thought that, except -and I quote myself – ‘He may have been giving a non-verbal clue.’ When I saw the film again, the non-verbal clue was in fact that the speaker was writing the truthful answer, in plain sight, on a pad of paper on the table in front of him! I clearly scored no marks for observation, but received a possible hint of some intuition. And this is where it becomes difficult: what is intuition? Is it simply an unconscious putting together of apparently unremarkable clues until they cumulatively present themselves as fact? Let me give you a somewhat embarrassing example. Once upon a time I was engaged to a vaguely glamorous and somewhat older man. We were staying with my parents while preparing for the wedding. One day I turned back on my way to work, threw up, went home and explained what had happened. The next day, I went to work, felt terrible during the afternoon, went home, and, according to my mother, walked upstairs on auto-pilot into my fiancé’s room – where I discovered an empty wardrobe, no luggage, and no note. It was weeks before it dawned on me that he presumably thought I was pregnant and had skipped the countrybefore the point of no return was reached. Then the bills started arriving, cheques bounced and people came calling at the house looking for him. The weeks leading up to the cancelled wedding were a nightmare, and it was a sudden realisation of something I had ignored that caused me to have a re-think. The whole time we had been dating, then living together, then engaged, I had suffered vicious migraines, and only when this crisis blew up did they stop. From three or four migraines a week, I have now had approximately one a decade ever since. I have had negative intuitions about people, that have proved accurate but which I can’t attribute to my own powers of observation. Although I do have a highly-trained memory, when I returned to Britain from New Zealand, it took me five years to notice that the number plate on the front of a car is a different colour from the one at the back. 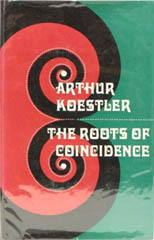 He proceeds to seek the roots of coincidence in the Alice-in-Wonderland world of quantum physics, the infinitesimally small subatomic realm where our everyday logic no longer holds sway, where particles can be waves and vice versa, where forces that only mathematical equations can glimpse swim in the dark, unfathomable ocean of probability before the manifestation of either matter or mind. Towards the end of the book, Koestler pleads that parapsychology be made ‘academically respectable and attractive to students’, otherwise the ‘limitations of our biological equipment may condemn us to the role of Peeping Toms at the keyhole of eternity’. 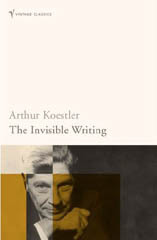 Koestler’s quiet interest in the paranormal probably stemmed from a mystical experience he had at the age of fourteen. Other such mystical moments befell him at various points in his life… he recalls in The Invisible Writing (1954), he underwent an experience in which he felt as if he were floating on ‘a river of peace, under bridges of silence’. Eventually, ‘there was no river and no I’; there was a sense of dissolution and of limitless expansion.